Once you've installed gnss-sdr and tested your installation with prerecorded data, the next step is to try and get a live GPS solution. The following is based off this node at gnss-sdr.org and this paper. The paper is a really good mix of theory and implementation and I strongly recommend reading it. Download an ephemeris via SUPL. 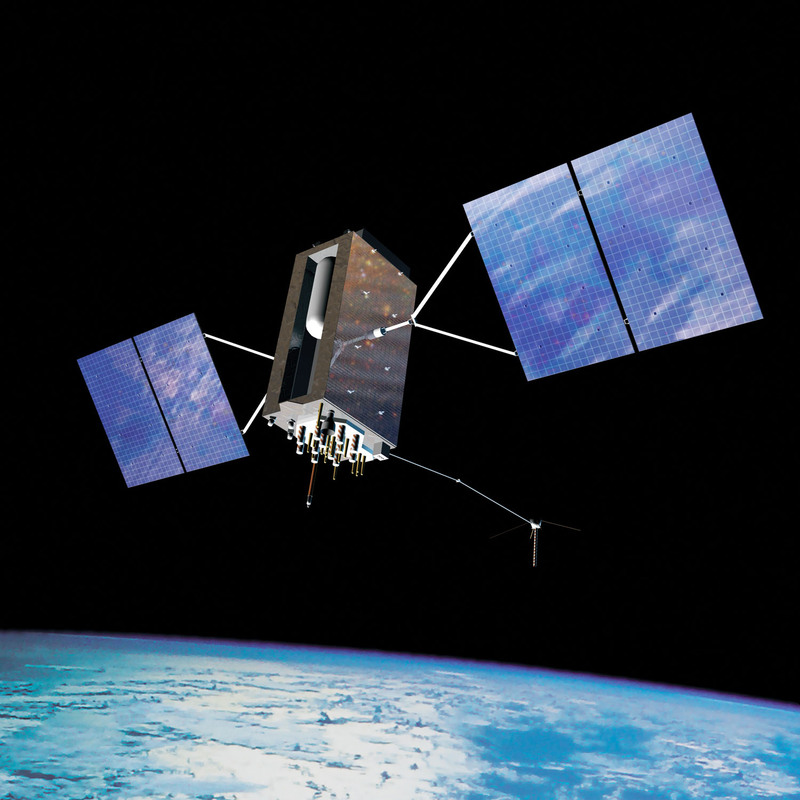 This provides your computer with advance knowledge of the GPS satellite locations, allowing you to get a quick fix. Use front-end-cal --log_dir=/path/to/log to change that. 30 1598.13 1621.38GNSS-SDR Front-end calibration program ended. The important outputs are highlighted above, the sampling frequency and the IF bias. The sampling frequency is nominally 2 MHz but deviation of a few Hz are normal. Baseband is defined as 0 Hz, so when the signal is shifted to baseband if the signal is not exactly centered at 0 Hz this bias is calculated as an IF bias. The red dots are individual position fixes. 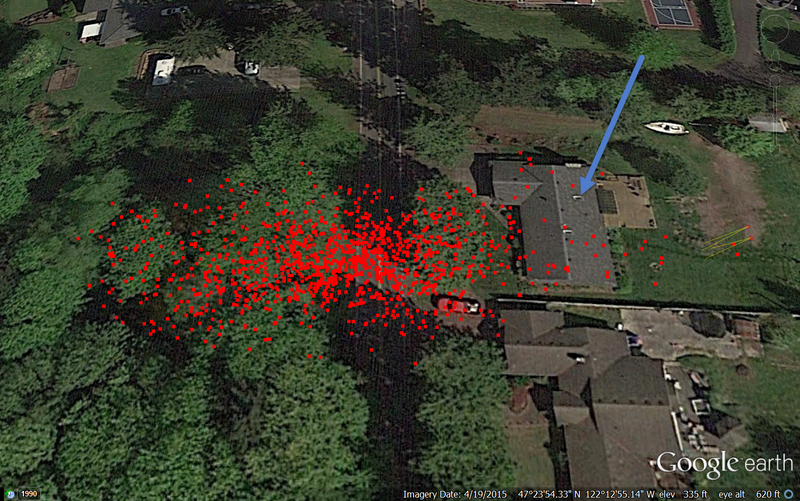 The blue arrow points to the skylight where my GPS antenna is mounted. The road is a two-lane road with no shoulder and the boat in the backyard is 20' long. There is a bias which may be due to the fact that the roof occludes satellites to the east (the four satellites I picked up were, at the time, overhead and eastward). I want to move the antenna up to a (plastic) roof vent in the attic to get a better view of the sky. Thanks for the very interesting post. I have been trying in the past to acquire GNSS signals using RTL-SDR without success. I would like to ask you which RTL-SDR dongle you are using and which antenna you are using. I have used an active GPS antenna and I have modified the dongle to bias the antenna and I have not succeeded to detect a GPS satellite :-(. I have tested my setup using the software https://github.com/taroz/GNSS-SDRLIB, but I could not get any solution. Could you give me any recommendation? I am using an RTLSDR with the 1ppm TXCO (similar to http://www.amazon.com/RTL-SDR-Blog-RTL2832U-Software-Defined/dp/B0129EBDS2/) with the bias tee mod and a generic GPS patch antenna (similar to http://www.amazon.com/HitCar-Active-Antenna-Connector-Stereos/dp/B00JE4GV8S/ ). Have you tried using gnss-sdr? 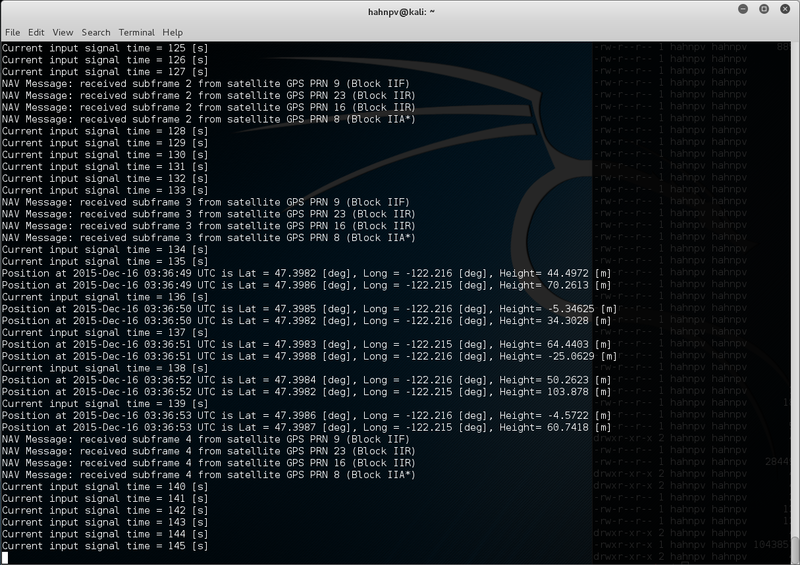 the ./front-end-cal script will try to get a snapshot of the GPS constellation and will give you an idea if your configuration is working. Also try receiving terrestrial radio with a whip antenna to ensure your RTLSDR is working properly. Thanks for the answer! I am using the same dongle as you and a similar antenna as yours. Do you know how to solve this error? Fernando, did you install the Google Test framework? It is one of the installation prerequsites. Maybe it installed but it is not in the include path? Also, did you follow the 16.04 installation instructions? I have simply followed the indications for Ubuntu available in the gnss-sdr github website. I have started from a clean Ubuntu 16.04. 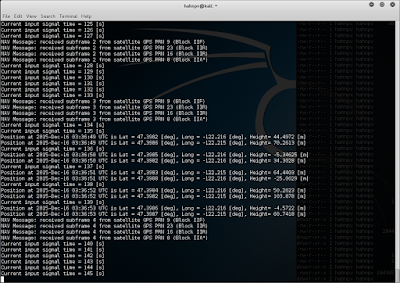 I will try with Kali VM. Let's see if I am a bit more lucky. When starting the config file I am getting a PLL not locked error. This happens in the front end config, and the real time config. In the front end config it does seem to find some sats. In the real time config it never locks. The satellites seem to lock and unlock. OOOOOOOOOOOOOOOOOOLoss of lock in channel 2! OOOOOOOLoss of lock in channel 7! OOOOOOOOOOLoss of lock in channel 1! Using 1PPM rtl-sdr with bias-t enabled and generic gps antenna. Sorry for the late reply - the OOOO's are GNU Radio indicating an overflow, that is, the dongle is producing more data than your computer can process in real time. What kind of computer are you using? Are you in a virtual machine? Mallikarjuna, if Osmosdr_Signal_Source is not defined, it means you have not properly installed Osmocom. How are you installing gnss-sdr? Nowadays on Ubuntu you can get it via apt-get (quite simpler than building from scratch as I did). I checked sourceforge mailing list the error they are mentioning is use of bias-tee or Low Noise Amplifier. But, in my case i am using LNA. Can, you please suggest solution to this problem. Are you providing power to the LNA? Is your antenna outside with a clear view of the sky? can you please suggest me what to do??? Hi I would check the amplifier with off-the-shelf receiver first to see if it works OK.